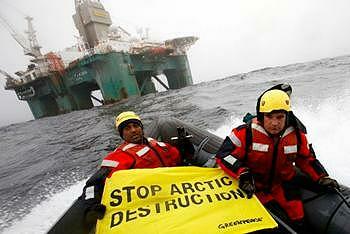 BAFFIN BAY, Greenland, June 17, 2011 (ENS) – Greenpeace International Executive Director Kumi Naidoo was arrested this morning after breaching a court-imposed exclusion zone to scale an oil rig 120 kilometers off the coast of Greenland in an attempt to stop the drilling. Naidoo and fellow activist Ulvar Arnkvaern are being flown to Greenland by helicopter to face charges. At 6.54 this morning an inflatable speedboat carrying Naidoo and Arnkvaern was launched from the Greenpeace ship Esperanza. It evaded a Danish navy warship that has been maintaining the exclusion zone by circling the Cairn Energy rig, the Leiv Eiriksson. Based in Edinburgh, Cairn Energy is one of Europe’s largest independent oil and gas exploration and production companies. Naidoo and Arnkvaern climbed a 30 metre ladder up the outside of one of the platform’s legs. As they climbed, rig operators tried to stop them from making it to the platform by firing a water cannon, but the Greenpeacers made it to the platform. His action comes a week after Cairn Energy obtained an injunction against Greenpeace from a Dutch court, imposing fines of 50,000 euros (US$71,500) a day for any breach of the exclusion zone. Cairn sought the injunction after 18 Greenpeace activists were arrested on the rig earlier this month for stopping operations. 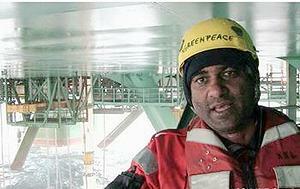 As the head of the global organization, Naidoo volunteered to scale the rig and personally deliver a new appeal to Cairn to halt Arctic oil drilling. As he scaled the platform he carried the signatures of 50,000 supporters from all over the world who have demanded that Cairn explain exactly how it would deal with a BP style deep water blow-out in the Arctic. That claim is refuted by independent legal advice obtained by Greenpeace showing that there is no such impediment to publication of the company’s oil spill response plan. Cairn plans to have the Liev Eiriksson drill to depths of around 1,500 meters (4,920 feet), depths similar to that of BP’s Macondo well in the Gulf of Mexico. The BP well suffered a blow-out on April 20, 2010, unleashing the largest offshore oill spill in U.S. history. Some four million barrels of oil tainted the gulf and fouled the shores of four states. “I did this because Arctic oil drilling is one of the defining environmental battles of our age. I’m an African but I care deeply about what’s happening up here. The rapidly melting cap of Arctic sea ice is a grave warning to all of us, so it’s nothing short of madness that companies like Cairn see it as a chance to drill for the fossil fuels that got us into this climate change mess in the first place,” said Naidoo, who hails from South Africa. Greenpeace says deepwater oil drilling in the Arctic is too risky for the environment and an oil spill would be particularly devastating and impossible clean up. The group is attempting to convince the world to move away from oil and gas to cleaner sources of energy to avoid the worst consequences of climate change. On May 26, Greenpeace joined with the two other biggest green groups in Scotland, Friends of the Earth Scotland and WWF Scotland, in a letter to Cairn Energy CEO Sir Bill Gammell demanding he stop hiding his company’s oil spill response plans. 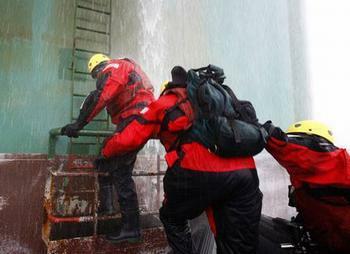 Last September, four Greenpeace activists who climbed a Cairn Energy oil rig in Greenland waters were arrested. In 2007 the Greenland government invited international oil and gas companies to again explore for hydrocarbons offshore Greenland. Cairn was one of many companies to respond, and Cairn currently has an interest in 11 areas offshore Greenland, covering an area of approximately 102,000 square kilometres. Naidoo, 45, was a youth leader in the anti-apartheid movement in South Africa, where he was arrested several times and charged with violating provisions against mass mobilization, civil disobedience and for violating the state of emergency. He lived underground before being forced to flee South Africa and live in exile in the UK.